EnregistrerThe Real is not simply opposed to the Imaginary, but is also located beyond the Symbolic, Lacan will assert. Unlike the Symbolic that is constituted in terms of oppositions such as that between presence and absence, implying the permanent possibility that something maybe missing from this domain, the Real is always in its place. It is an absolute condition. Whereas the symbolic is a set of differentiated, discrete elements called signifiers, the Real is, in itself, undifferentiated; ‘the real is absolutely without fissure’. To this effect, it is the symbolic which introduces ‘a cut in the real’ in the process of signification: ‘it is the world of words that creates the world of things in the process of coming-into-being. Lacan will gradually link the real with the concept of impossibility. The real is ‘the impossible’, because it is impossible to imagine, impossible to integrate into the symbolic order, and impossible to attain in any way. And because it’s impossible, the real has a traumatic quality. 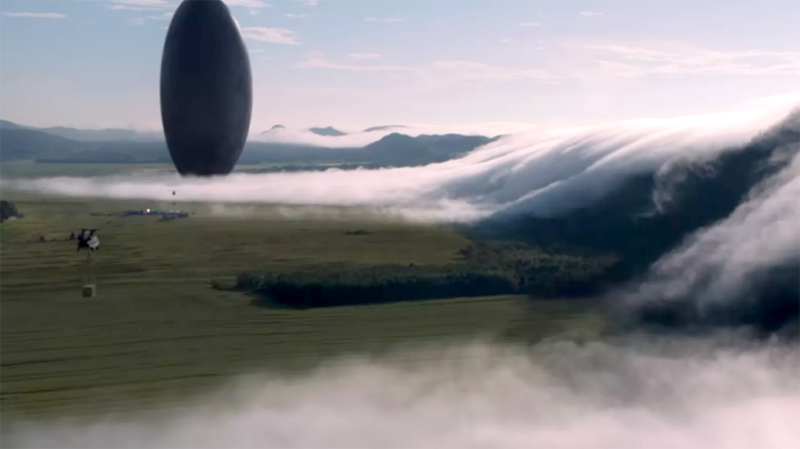 This is more or less what is happening in the film Arrival, when alien megalithic menhirs appear over 12 areas of the planet living its speechless inhabitants in crippling awkwardness. They are here but we don’t know what they want. The plot of the movie is simple but nevertheless condenses the essence of the Lacanian perspective. Shortly after the arrival of the twelve monoliths, a linguistics professor is approached by a military man presenting her with a recording of the alien language, and asking her to decode it so as to figure out why they’ve come to our planet. At the same time, nations across the world try to coordinate their individual findings with a global coalition, in order to understand their purpose. Photographed in shady colors and followed by a pertinent musical lyricism, the movie conveys an existential suspense throughout; and thus manages to bring the professor on stage as the connecting link in this science-fiction signification. The professor is a woman; she became a mother only to experience the adversity of seeing her daughter dying. Along this fragility, Arrival presents a human being having experienced loss and bereavement who as a lingual generator, finds a connection again. She is expecting a revelation! Hence, having as a starting point a traumatic deprivation, the movie delineates an encounter from the view of a real, which we could assume is equivalent to the object of anxiety that cannot in any way be mediated by words. And as unmediated objects, the alien spacecrafts require the contribution of a linguist who will attempt a symbolic fissure in their parlance. The people in Arrival anguish over the question: Why they don’t respond? What do they want? Questions that refer to an encounter that Lacan will define as the domain beyond imaginary. People are faced with a presentation that condenses what he will call, the revelation of which all words cease and all categories fail; the object of anxiety par excellence. Thus, the movie weaves an Aristotelian tyche, which lies beyond any (symbolic) automaton. In the cinematic universe of the movie the people don’t become delusional; they don’t depersonalize; and they don’t lose their connection to reality. We are not dealing with the advent of psychoses, of that which was left outside the symbolic order and appears in the real. Besides, this is not the intention of the director. There is nonetheless an existential upheaval in front of the certainty of the arrival, which however has a quality of a certain event for everybody; of an inaccessible event that evokes a psychic ambivalence. Wish on one hand to introduce a symbolic function since their own Other does not suffice to constitute the alien being as subjects; and on the other hand the emersion of agony in front of the Unheimlich of the presentation and wish to retaliate through violence. This direct encounter with the radical alterity of the Thing, introduces on stage along with the anxiety the spectrum of death. The blackish menhirs from the unknowable x position, like the Kantian thing-in-itself, unfold their simulacrum as an absolute condition, living their signifying inertia in the horizon of a universal ontological event. Arrival may not be Space Odyssey with those monumental scenes sound-tracked by Strauss’s Blue Danube intensifying the lingering ontological anguish. However, those mysterious black monoliths appearing in Odyssey have a close signifying kinship with the objects in Arrival; a close kinship with every cinematic product conveying the concept of strange and prosecutory, of the unknown becoming threatening, of the uncanny that disturbs the symbolic harmony in an attempt of rewriting the age-old and anxiety-provoking question about existence. In the realm of science fiction aliens have visited earth many times. They sometimes come to us for help, sometimes to annihilate and some others to simply co-exist. In this particular imaginary dialectic however, they hold up a mirror in the reflection of which man has to reinvent his orthopedic. To this effect, in the self-referential question that humans raise ‘why are they here?’ we could safely assume that they are erecting the imaginary representation of the phallic signifier as a response; the Phallus as the One of Existence, the trauma as the very encounter with jouissance. Lacan J., (1998). The Seminar of Jacques Lacan, Book XI, The four Fundamental Concepts of Psychoanalysis (1964-1965). Norton & Company, Inc., New York USA, p. 54.